On our cooking class through books, today we went on a tour of Paris. We read Eva Montanari’s Chasing Degas, while waiting for our Cheating Chocolate Croissants to be ready to come out of the oven. I love Eva Montanari, and I’ve also reviewed another book by her here. Her illustration style is very beautiful, plus her stories are also great. In this one, a little ballerina chases French artist Edgar Degas all throughout Paris because he mistakenly took her bag with her tutu. Her quest takes us not only through the different places of the City of Lights, but through a wide variety of Impressionistic painters and their styles (from Monet to Renoir). It is a great book to introduce children to the impressionists and the way they dealt with color, their subject matters and a glimpse at their life. At the end of the book there’s an extra couple of pages with brief bios of each painter featured, plus the paintings they were doing during the story. It is a wonderful book for any budding art-dance enthusiast. Take the Puff Pastry out of the box and place on a lightly floured surface, covered with plastic wrap. Do not unfold it yet... wait between 20 to 30 minutes until it is soft enough to handle. Preheat the oven to 400º F with the rack in the middle rung. If you're using two cookie sheets, place the racks in the lower third and upper third of the oven. Once the dough is soft enough, dust with flour and roll it out expanding it a little more. Cut the rounds. you should have enough for 10. Place a tablespoon of chocolate and top with a tablespoon of chopped nuts. If you're using peanut or almond butter, put a tablespoon under, in the center of each round -- then top with chocolate. I'd love to try using Nutella as well! Brush the tips of half the round, then fold the dough over the filling. Press on the corners, and use a fork to make sure the sides of the pastry are well sealed. Place on the baking sheet, about 2 inches apart of one another. Brush the tops of each pastry with the remaining egg, then sprinkle with sugar and crushed nuts. Place in the oven for about 15 minutes, or until the tops of the pastries are golden. Let cool on a rack, and enjoy! 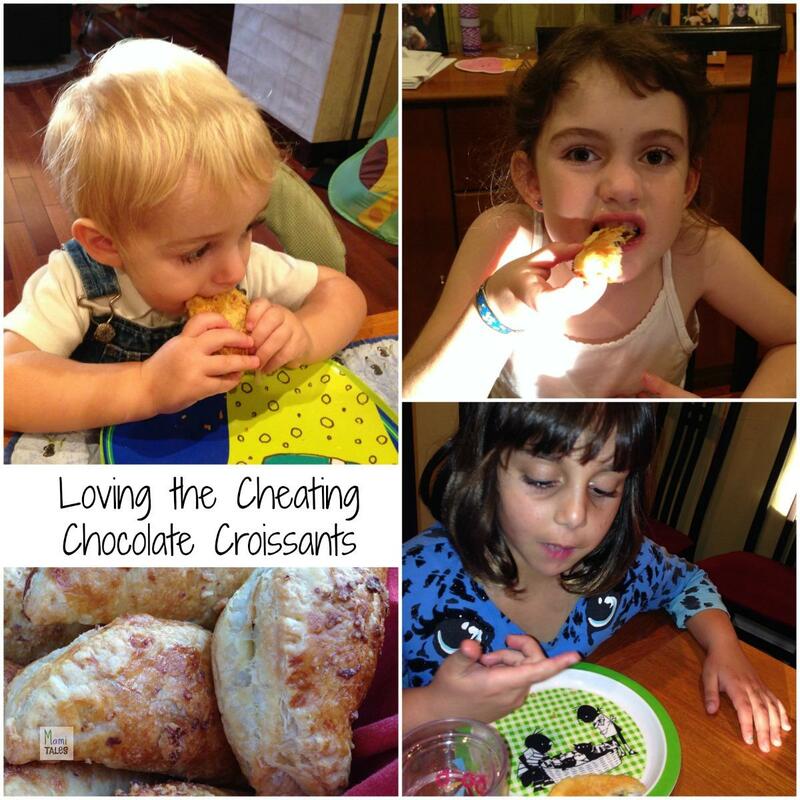 So, make this Cheating Chocolate Croissants and cuddle up with your little one to read Chasing Degas! Tagged Baking and Cooking, Book reviews-recipes, Cooking with Children, Desserts. Thanks! They are ridiculously easy to make.